Deion Sanders Says Divorce Has Him "Tapped Out"
Deion and Pilar Sanders and their attorneys met in a special hearing Wednesday, eight weeks before their divorce heads to trial. 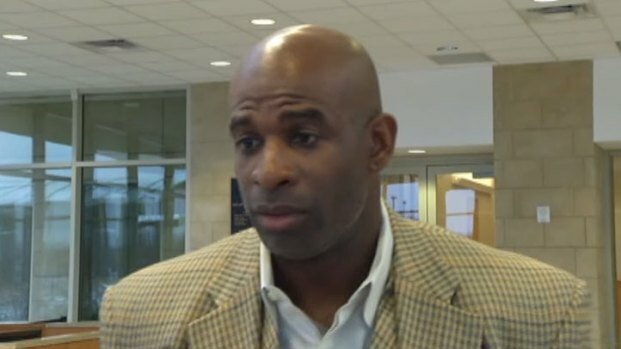 During the hearing, a continuation of proceedings that began in late December, Deion Sanders said he won't be able to bring himself to speak to his soon-to-be-ex wife once their divorce is final. A therapist who had treated the three Sanders children took the stand for much of the morning. She said that while she had not had a session with the two boys and girl in about two months, she had noted during several months of visits that there was a lack of co-parenting between Deion and Pilar Sanders. The therapist said the couple do not communicate at all and that the children seem divided. Sanders: "I Can't Afford All This Mess"
Eight weeks before their divorce heads to trial, Deion and Pilar Sanders were back in a Collin County Courtroom on Wednesday. The therapist for Sanders children and some teachers took the stand, along with Deion Sanders himself. The court heard testimony about an incident in which the Sanders' oldest son ran away from his mother's custody, entered a paint store in Celina and begged to use a phone to call his father, citing abuse. But Deion Sanders said his children are doing well, despite the very public divorce. "You can't take a snapshot of one moment and say that's how my kids are doing," he said. "My kids are wonderful. We came off a wonderful vacation. They're doing great in school, great in sports." He added, however, that the children have been exposed to too much information from the Internet and other reports on the divorce. Sanders currently has primary custody of his two boys and pays $5,500 per month in child support to Pilar, who keeps the couple's daughter most of the time. During his testimony, Sanders asked for his child support to be reduced, saying his income has dropped and he isn't covering his expenses. "I can't afford it," he said, also referring to his legal fees. "I live a modest life. I'm no longer a player. I live on a strict budget -- I can't afford all this mess." Sanders added that he does not understand why the divorce process is taking so long, given that a judge upheld the couple's prenuptial agreement. "This is ignorant -- this is taxpayer money, on something that the judge ruled a couple of months ago that the prenup was valid," he said. Sanders added that he has lost out on $500,000 to $750,000 in endorsement deals because of the negative publicity surrounding his divorce. The divorce will go to a jury trial in March.